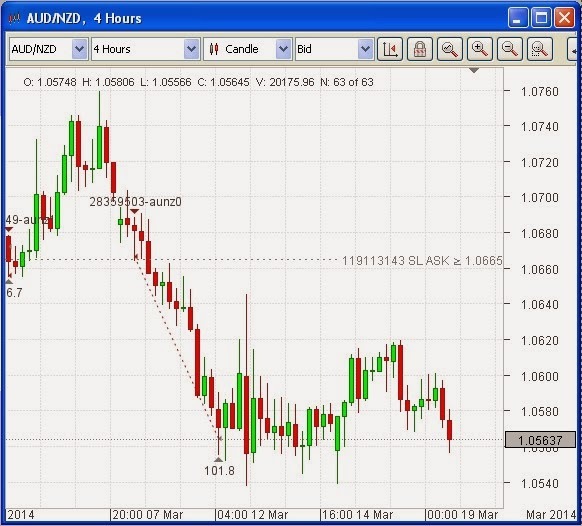 We have had a bias towards a lower Australian dollar for some time. This is based on the need for that country to transition from a mining based economy to one that is supported by internal consumption; a lowering of growth expectations in China, which is a very important market for Oz; and employment levels which, while robust by the standards of many other developed countries, are soft by Australian historical measures. There has also been, in the not too distant past, commentary by many officials of the Reserve Bank of Australia (RBA), which has attempted to bring down the value of the Aussie, one of which would have it in the 50 cents to the US dollar area or not much more than about half of where it is at the moment. Now the AUDUSD pair has hit its 200 day Simple Moving Average (SMA) (blue curve in the chart above) a well respected delineator of support and resistance. Given the fundamentals, it might look as though this were a good place to go short the pair. 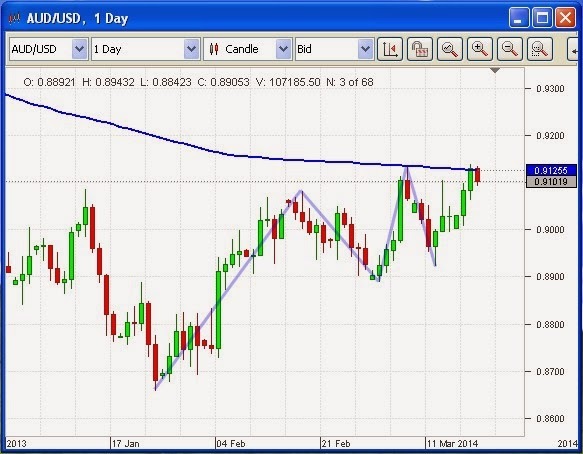 There is only one problem – the daily chart also shows that it is in a local uptrend. This is, as usual, shown by the existence of higher highs and higher lows. Or this could be the making of a double top. Janet Yellen’s comments at the FOMC press conference yesterday look like they have increased the likelihood that this is indeed the case. We never like to go against the trend so we will be keeping our powder dry, but only until such time as a new downtrend shows evidence of its existence. On March 10th last we took a short position on the Aussie against the New Zealand dollar, or Kiwi. This was based on the analysis outlined here. This trade worked well for us and a few days later we were able to take off half the position when profit had reached 2% of equity. The associated stop loss order was moved to break-even at the same time, leaving us with a free trade on the rest of the position. AUDUSD moved sideways for a while after that, treading water, it would seem, while the crisis in Ukraine / Crimea was at its height. It now seems to be resuming its downward tendency. All good.